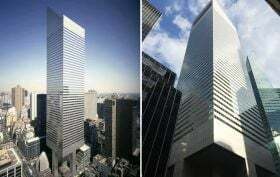 The Midtown East skyscraper formerly known as the Citicorp Center, now called simply 601 Lexington Avenue, was made an official city landmark this past December, thanks to distinctive features including its 45-degree angular roof and base of four columns that resemble stilts. 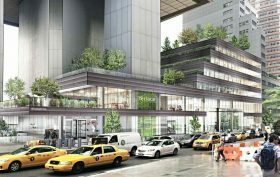 When designed by Hugh A. Stubbins & Associates in 1978, the site also included a privately owned public space with a connection to the Lexington Avenue-53rd Street subway station, which co-owner Boston Properties is now looking to update. 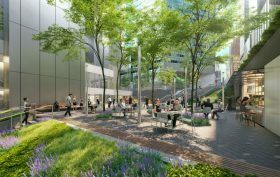 They’ve tapped the designers at Gensler to envision a 200,000-square-foot “Market Building,” which will consist of a new outdoor plaza and terraces, as well as an interior atrium space that will host trendy dining and retail options. 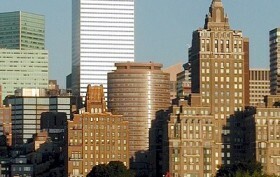 The Midtown building formerly known as Citicorp Center has just been designated a city landmark. The building, now known simply as 601 Lexington Avenue, is one of 12 buildings in Midtown East to be given landmark status by the city’s Landmarks Preservation Commission. This newest batch of landmarks brings the number of official historic buildings in the area to 50, Curbed reports. The 59-story office and retail tower, designed by Hugh A. Stubbins & Associates, was completed in 1978. It was considered quite innovative for its time, with distinctive features that included a 45-degree angular roof and a base of four stilt-like columns. The latter allowed it to cantilever over Saint Peter’s Church, also on the site. There is also a privately owned public space that connects the buildings to the Lexington Avenue-53rd Street subway station.